The weekend is here again and I am sure quite a number of you are as excited as I am. Anyway, if you haven’t already made plans (or if you have), that’s just great as I would like to invite you all for a time out with the ladies. 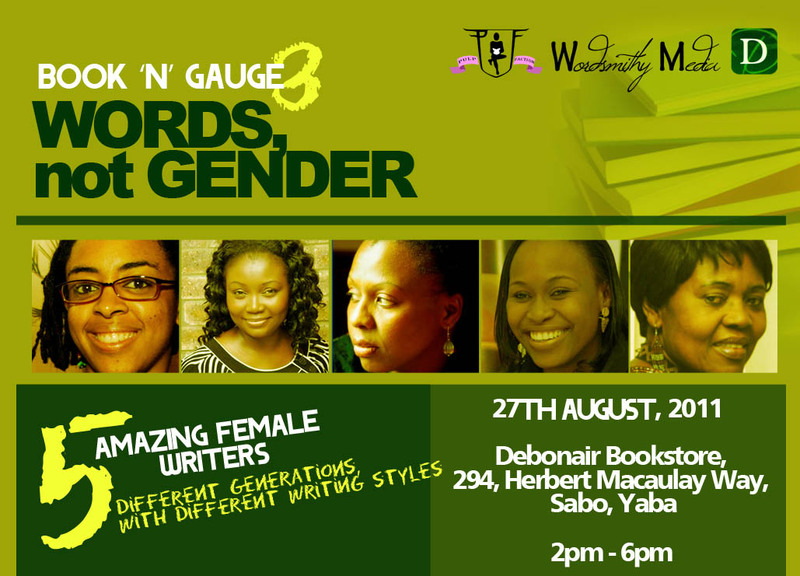 Five award winning writers: Lola Shoneyin, author of “The Secret Lives of Baba Segi’s Wives’’; Akachi Adimora-Ezeigbo author of “Roses and Bullets”; Seyi Oke author of “A Time to Heal”; Joy Bewaji author of “Eko Dialogue” and Simidele Dosekun author of “Beem Explores Africa”, will be storming Debonair Bookstores for Book n Gauge III tomorrow. Come with five friends and get a free book! NLNG Prize: Grand but unhelpful? There was a strong critique of the NLNG Prize for Literature in NEXT newspaper over the weekend. We agree with most of it. In our view as publishers, the aim and structure of literary prizes such as the NLNG’s should be to sustainably advance the writing career of an author, and to support sales of his or her work, not just reward the writer with a huge sum of money (very huge, in this case). In an environment like Nigeria where there is virtually no distribution for books, the work of the prize may have to include helping to get the books out to the reading public, such as through sponsored book tours. Read the review here and send in your comments. Just to give you guys a heads up on an upcoming Farafina title (besides Eghosa Imasuen’s Fine Boys) which will be released in the next couple of months , “One Day I Will Write About This Place’’ by Binyavanga Wainaina. In this vivid and compelling debut memoir, Wainaina takes us through his school days, his mother’s religious period, his failed attempt to study in South Africa as a computer programmer, a moving family reunion in Uganda, and his travels around Kenya. The landscape in front of him always claims his main attention, but he also evokes the shifting political scene that unsettles his views on family, tribe, and nationhood. You can read a more detailed review in The New York Times –Sunday book review section. We sit in the dining room, and talk from breakfast to lunch, plates with congealing eggs littering the table. Every so often my mother will grab my hand and check my nails; a finger will reach into her mouth and emerge to lick a spot off my forehead, smooth my eyebrows. She stands to clear the table. She is swiveling her radar, like she used to do when we were children, half asleep, shuffling softly in her caftan, disturbed by something intangible. They are worried about me, and for the first time in my life, worried enough not to bring it up. I have not spoken to them about my stalled degree in a long time. They know. I know. I am wracked with guilt and am avoiding Baba. He has been gracious so far – has said nothing. All that wasted money on my degree. We asked, you voted, now here’s the result. Since the invention of the printing press around 1440, mass production of books (in print form) has been made possible, bringing about a change in the face and state of things throughout the world. However, in recent years, we have observed a blast in the popularity of the electronic books, thefore our interest in your opinion. Book lovers all over, please weigh in on this important question: Which would you rather read: an e-book or a paper book? Please cast your vote in the poll below, and be sure to leave basis for your choice in our comments section. E.C. Osondu’s publicity tour for his collection of short stories, Voice of America, came to an end on Saturday with a packed reading at Terra Kulture. If you missed the tour, you can read about the first event here. The other events were not so contentious, but all were full of interested readers and marked by lively discussion. Also listen out for EC on Smooth FM 98.1 this week, and look out for an interview in ThisDay.